Since AOL launched AIM – the original mass market IM (Instant Messaging) application – in 1997, instant messaging has exploded into the 21st century as the premier form of digital communication. In particular, mobile IM has taken front and center in the contemporary digital communications, as Wechat, Telegram, and Whatsapp have become household names known and used daily by individuals across the globe. Today, we will examine the next iteration of IM, and the power and potential of its implementation on Elastos. As most know, Wechat is a centralized social platform, which means that privacy is not offered on the Wechat platform. One-on-one conversations are far from private and everything exchanged on Wechat is tracked, consolidated, and stored. In China, individuals are unable to express themselves freely under the pressure of government supervision, as they can be banned or blacklisted if their communication involves sensitive topics such as politics. Because Wechat formulates and enforces the rules that govern its platform, it stands alone as a central authority and has all the power. The beauty of IM on Elastos is that it inherently recognizes and supports freedom of speech, which is a fundamental human right in which any individual may freely express his or her opinion without fear of retaliation. Personal opinions and perspectives should not be subject to censorship or restriction – we all deserve a voice, and we ought to feel safe using it. So how does Elastos ensure this right to free speech? The answer lies in a suite of powerful core technologies and the elegant infrastructure that connects them. Elastos Carrier is the peer-to-peer network where nodes are connected through F2F (Friend to Friend) rules to ensure mutual trust among nodes. The information transfer between nodes is all encrypted so that data leakage is completely avoided. 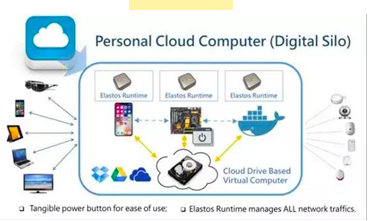 In order to prevent nodes from being attacked by hackers and malware, Elastos also supplies a virtual machine: Elatos Runtime. Following the principal that communication is orthogonal to computation, Elastos Carrier and Runtime together manage all network traffic. Runtime functions like a condom to protect apps from being attacked by virus and malware. To ensure basic trusted management, each node and virtual machine is assigned a unique DID by Elastos’ DID sidechain rather than by a centralized platform that would be typically controlled by a centralized entity. All the connections on the network are established through DID. The physical address IP is not necessarily exposed any more, thus DDOS attack is effectively prevented. In order to further achieve identity authentication, DID can be combined with a privacy-protected sidechain to establish a decentralized KYC authentication process. As a result, a secure and trusted P2P network is realized. But this alone is not enough to support a robust dapp ecosystem. Data is inevitably generated from the use of applications – the question is where it should be stored. If data is stored on the local device, the data can be lost if the local devices are lost or broken. Thus, the cloud presents an excellent option for secure, long-term storage. Currently cloud storages are centralized and therefore not credible. But there are now trusted cloud storages that combines blockchain technology and cloud technology, such as the IPFS distributed storage system. Therefore, a user can build his or her own cloud storage space with the help of DID. Because there exists a variety of different Apps, each DID may establish multiple data spaces, and each data space ID is associated with a unique DID. The next step is to determine how to compute. The virtual machine that runs the application should not be local; rather, it should be on the cloud as well. It is very important to build a trusted cloud computing system so that it is feasible to start a virtual machine to run the application on the cloud at any time. In this way, Elastos achieves a private p2p chat or group chat. In the Elastos browser, the group chat is initiated with Elastos DID. It is automatically loaded after the virtual machine is started and the data space associated with the DID is provided. If invited, other DIDs will access and use the chat application of this virtual machine. Thus, a private chat scene is realized and the parameters of the chat are managed by the one who initiates the chat. Really a chat is simply a small program which achieves the distributed computing of the application, rather than the centralized platform that requires resources to process a large amount of computing. Currently there are several IM projects on Elastos. As only one instance of its potential applications, Elastos perfectly implements a secure and privacy-protected Dapp environment fit for messaging in true privacy. Elastos provides a secure and reliable Internet operating system with high flexibility. It supports three types of Dapps. First: An application that the traditional framework can establish with standard Client/Server architecture, but the access object is not the IP address but the Elastos DID. Third: A Dapp that is directly on the chain and based on smart contracts. Therefore, with the peer-to-peer distributed Internet operating system of Elastos, it is possible to implement a large-scale decentralized application for various use cases.